Isn't she the sweetest thing you ever saw, Her name is Marci and she's a stamp by La La Land stamps and I got her from FatCatsCardCorner. I coloured her with Copic Ciao's using E31,E50, E57, E00, E51 for her hair and skin. R00, R22 and R32 for her dress and C1,C3,C5 and C7 for the her little panda doll. The background I made with pastel pencils. The large flower petals I coloured with copics to match her dress, the little rose I made. 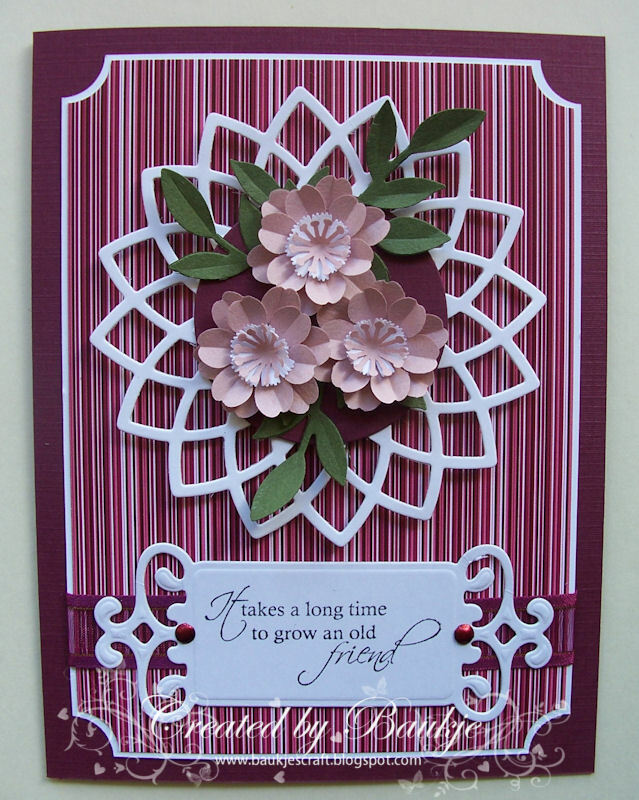 The floral flourish leafs are a BossKut die which I also got from FatCatsCardCorner. so made myself sit down and colour them with copic ciao's. The colours I used were R22, R29, R35 and R59 for the flowers and G94 and G96 for the leaves. 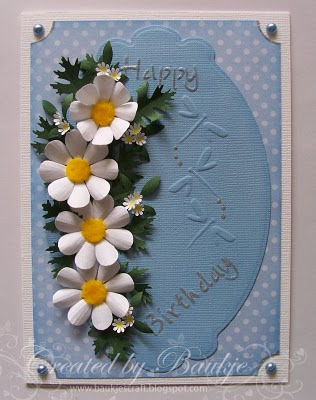 cut them with Spellbinders standard circles large and layered onto Spellbinders petite scalloped circles large. The lattice is Lattice 2 Dies Direct cutting die which I got from FatCats. The background I made in my Paint Shop Program by making a paint brush from the stamped poppies. These sweet little flowers are newly designed by Angie, which she has named in memory of her mother. I have placed them onto a Spellbinders Lotus Pendants shapeabilities layer. The tag is a Spellbinders Fancy Tags. The sentiment stamp, ribbon and DP are all from GinaK Designs. 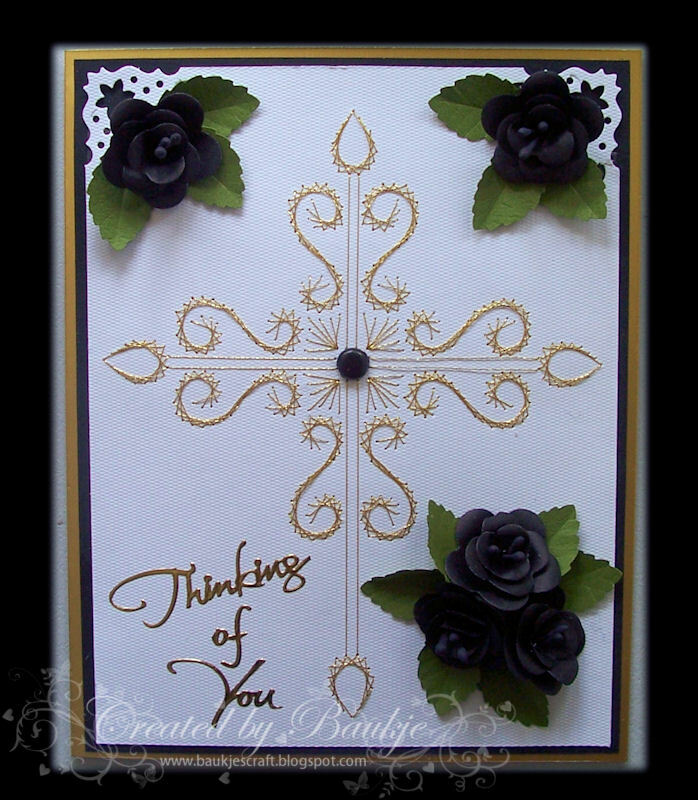 I had a bit of trouble photographing this card the roses wouldn't show clearly so I had to lighten it a bit in my editing program. On this card I have used the stitching pattern from Ann's Paper Art, corner punch is Martha Stewarts Poinsettia Flourish, and the roses were made with the Creatables 6 petal flower die available from FatCatsCardCorner. 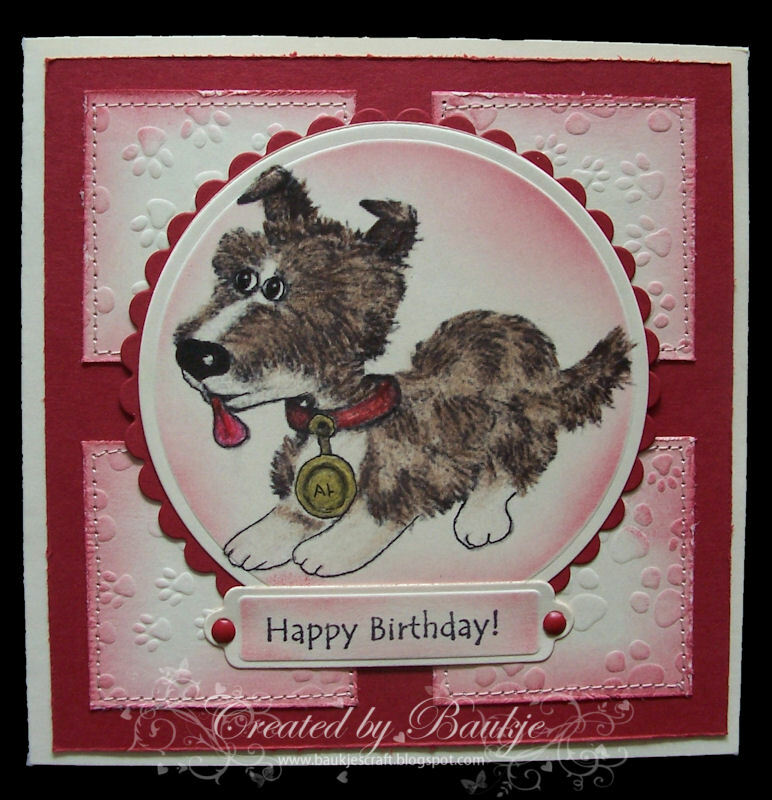 The doggy stamp was coloured with Faber-Castell coloured pencils, then cut out with the standard circles large nestability and then layered onto the petite scalloped circles large. The back ground layer was done with a Fiskares texture plate cut into squares and inked and distressed around the edges then machine sewn. I spent most of mine battling with my computer, but I think I have it all running smoothly again now. 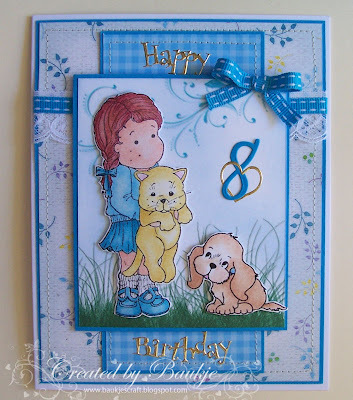 Our youngest grand daughter Lahni is turning eight so I had to get her card finished as well as fighting with my PC. I coloured Tilda and cat and the little puppy with Faber- Castell colouring in pencils and blended with odourless solvent. The background I made in my Paint Shop program and sponged with Memento Summer Sky ink. Two more cards to show you using the Cottage Daisy. 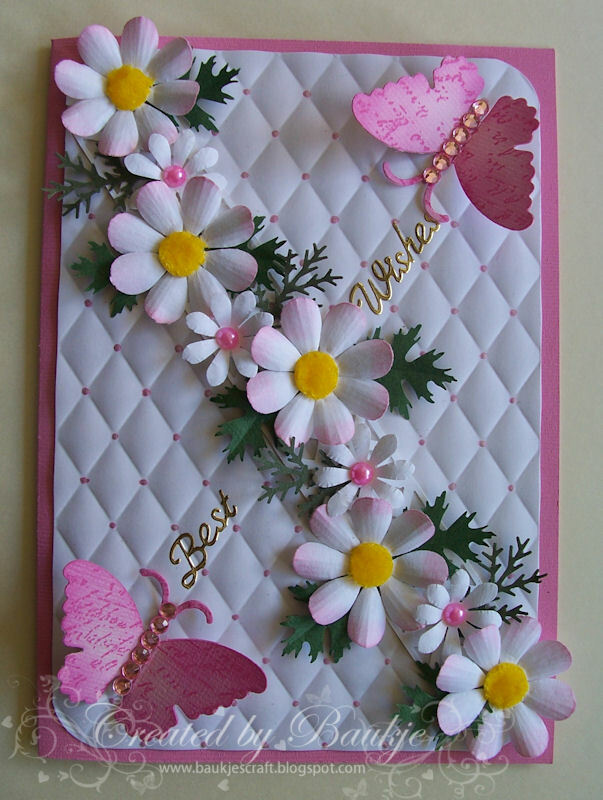 The gorgeous quilted card is from Christina Re called Luxury embossed card, I love it but it only comes in Powder Puff Pink and white, and comes in packs of five. I feel that this card is a little on the busy side, but I've already posted it off to a dear friend so lets hope she likes it. 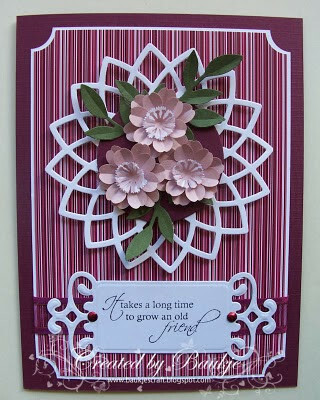 I embossed the background with the Craft Concepts In stitches embossing folder and then sanded it slightly. the little hearts border was another brass stencil and light box job also sanded. 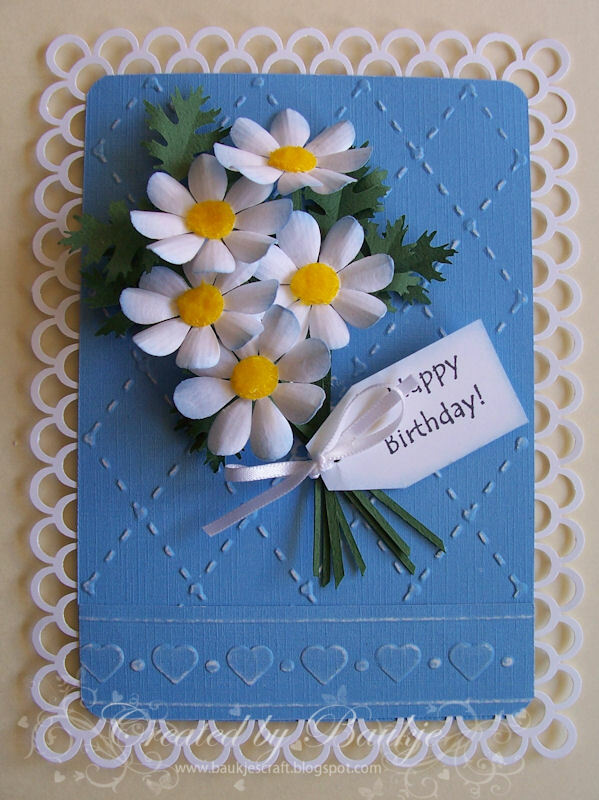 I have a card to show today that uses up some of the Cottage Daisy's I have made form Angie's E-Book, Penny Flowers. I dragged out my light box and some brass stencils as well and embossed the dragon flies and the Happy Birthday.